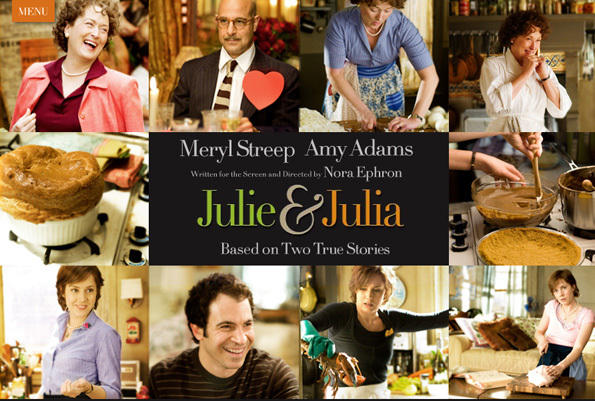 Today I had the opportunity to watch the 2009 movie Julie & Julia. I’ve always wanted to watch the movie but had never taken the time to do it. I’m really glad I did, it’s a great movie. I mean first of all it’s about food, what’s better than that. Two it’s about blogging which is what I’m currently doing and three it’s about being a writer. It’s really kind of inspiring to watch the story of this woman who realized she wanted to do something and she made a plan, set a deadline and did it. Both of the women in this story are inspiring. It can be hard sometimes to watch stories like that. I mean we always tell ourselves we can do anything but then we look at these people who have made something of themselves and we’re like I’m not her, I’m not that great. We forget that they had to start somewhere too, they weren’t born famous or legendary. However, sometimes we still think well just because it happened for her doesn’t mean it will happen for me and that’s true. But that’s not the point. I’m sure if you looked at most of our legendary and revered creative minds they didn’t create for the fame they might get. They created because it was their passion, their life, because they wanted to create something new. And yes they may have wanted it to reach millions of people but not so they would become a household name but because it would mean that their creation had an influence. I’m glad I decided to watch this movie now. It’s a good movie to watch when you are on the precipice of starting something new. In some ways I kind of feel like Julie. I’m terrible at finishing things. One of the first writing projects I ever truly finished was from one summer before my senior year of college. I told myself I had to write a book in it’s entirety from start to finish. I wasn’t allowed to work on anything else or stop and go back to fix anything. I just had to keep going until it was done. For the first time in my life I had finished writing a story. It felt amazing! Well I haven’t managed something like that again. I always have some sort of excuse. I think I want to make this blog my next project. I just need to figure out what I want to do exactly. I’m tempted to try and set the goal to blog every day but I’m not sure I could manage that. I don’t know, maybe you could give me some ideas. I’ll for sure have to to think about it though.